CJI honored District Court Chief Judge Claude W. Appel, County Court Judge Sabino E. Romano and Magistrate Marianne M. Tims at the 2014 Judicial Excellence for Colorado Dinner. 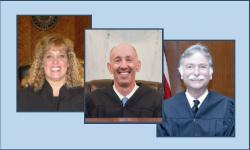 The 2014 Judicial Excellence for Colorado honorees were District Court Chief Judge Claude W. Appel of the 3rd Judicial District, County Court Judge Sabino E. Romano of the 17th Judicial District and Magistrate Marianne M. Tims of the 1st Judicial District. Judge Sabino Romano was appointed County Court Magistrate in Arapahoe County in 1983, after being in private practice. In 1986 Judge Romano was appointed as an Adams County Judge by Governor Richard Lamm and has served in that position for 28 years. Judge Romano, known as one of the friendliest judges in the 17th Judicial District, has handled the full scope of County Court cases. He handles civil cases exclusively. Judge Romano processes approximately 31,000 cases and presides over 400 trials per year. Magistrate Marianne Tims is the 1st Judicial District’s Chief Magistrate and has received much acclaim for her work protecting children and trying to resolve family issues, a specialty that she proudly embraces as her life’s work. Prior to her 2004 swearing in in Jefferson County, Magistrate Tims had been a county attorney in both Jefferson and Arapahoe counties handling child protection cases. As Chief Magistrate, she administers six other magistrates and staff. In addition to overseeing the magistrate divisions, she also coordinates with the district court divisions who hear the juvenile and domestic cases coming out of the magistrate divisions.